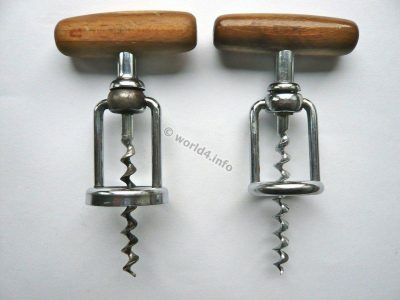 Two of the same type corkscrew. The special is because of this style in the mobility of the spiral. At the upper end, in the center of the corkscrew is attached a kind of ball bearings. This allows the corkscrew to rotate in different directions, allowing a more flexible approach. Previous PostAntique can opener. D.R.P. German Brand Sieger.